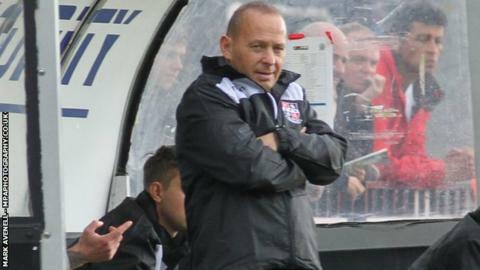 Bromley boss Mark Goldberg says his squad's belief in their playing system is the reason for their recent success. The Ravens have won their last six league games to rise to fourth in the National League table. "We showed the players a presentation during pre-season and I gave a speech about how important our system is," he told BBC Radio Kent. "When they see it working they start putting more effort into it, living and dying by working towards the system." Bromley were promoted from Conference South last season as champions and are in their first season in the top tier of the non-league pyramid. Goldberg, who was re-appointed as Bromley manager in 2011, says his favoured 4-4-2 formation has "evolved" during his management career. "We believe we have a way of playing that can win games and be defensively resilient as possible at the same time," he added. "We set out in pre-season with video analysis and presentation of everybody's roles and responsibilities within the system. "They know what is expected of them and it is paying dividends. It's not complicated but it's important everybody plays their part. "If there is any doubt or any individual who does not play for the team, it can disrupt everything we are doing. "We will keep adapting the system and adding to it. The longest-serving managers in the world keep learning all the time and strengthen whatever game-plan they work to."